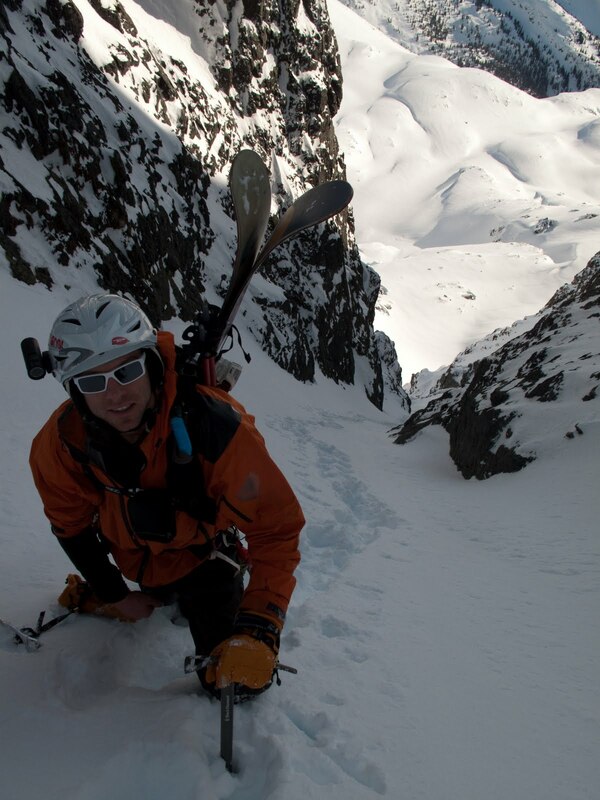 2011 is my inaugural sledless season, forcing me to get after some of the peaks in the non-motorized Garibaldi Park. Cheddar, AK Mike and I skied off Blackcomb Saturday morning and set up a base camp near Wedge mountain. Our mission was to conquer Lesser Wedge's east facing couloir, that Cheddar has spotted from opposing ridges years prior, instantly ranking it near the top of his hit list. Upon seeing it "that's a sick, gnar couloir" spewed from his mouth. Sunday dawned blue skies as we skinned through the trees to the base of Lesser Wedge, where we traded skins for crampons. With our skis strapped onto packs, we used crampons and ice axes to claw skyward. It's nice to climb a big line before skiing it, to test snow texture and possible dangers; and today's snow was as good as it gets. Upon summiting, the 360 degree view was spectacular, but the peak winds didn't allow for much sight seeing, and the coulie was calling. We took turns leading different pitches, regrouping in safe zones then continuing down. 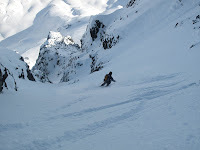 Until this day, I've never skied a couloir where every turn was perfect snow. High 5s were thrown at the base as we admired our temporal tracks. A piece of art in its purest form. I had to get back home, while Cheddar and Mike stayed another night, so as darkness approached I set off, loaded with camping, climbing and skiing gear. In hind sight, returning solo up a new route in the dark, in a snowstorm, with dead batteries in my GPS probably wasn't the best option; it was that, or have my family call SAR if I didn't return. To make a long and painful story short I made it back by 2 AM, about six hours later then expected. Mamma Treadway tried making me promise to avoid those situations, but I couldn't lie to her. The truth is, we do try to minimize and prepare for risks, but in reality, life without danger would just get boring.